Throughout the years, many cryptographically verifiable voting systems have been proposed with a whole spectrum of features and security assumptions. Where the voter casts an in-person (and possibly paper) ballot and leaves, as is common in a governmental election, the majority of the proposals fall in the category of providing unconditional integrity and computational privacy. A minority of papers have looked at the inverse scenario: everlasting privacy with computational integrity. However as far as we know, no paper has succeeded in providing both unconditional integrity and privacy in this setting—it has only been explored in boardroom voting schemes where voters participate in the tallying process. 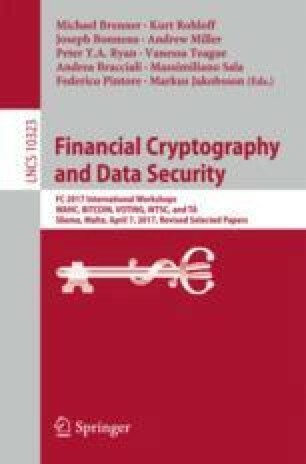 Our paper aims for a two-level contribution: first, we present a concrete system with these security properties (one that works as a backend for common ballot styles like Scantegrity II or Prêt à Voter); and second, we provide some insight into how different combinations of security assumptions are interdependent. We thank Claude Crépeau for helpful insights. We thank the anonymous reviewers who pointed out relevant work, suggested interesting ideas, and showed us where our paper needed more clarity. The second author acknowledges funding for this work from NSERC and FQRNT.